Football is all about trophies and awards. On both international and club level, teams are in a constant battle for supremacy which is decided by the honours they win. Even though football is a team sport, individual awards still matter. Awards like Ballon d'Or and FIFA The Best are still the most prestigious of all. Note: The awards considered in this list are the top individual European and FIFA awards. They include Ballon d'Or, FIFA World Player of the Year, FIFA The Best, European Golden Shoe/Golden Boot and FIFA Puskas Award. Without much ado, let’s take a look at the ten footballers with most individual awards in world football. The ex-Barcelona star and Brazil legend closes the top 10. 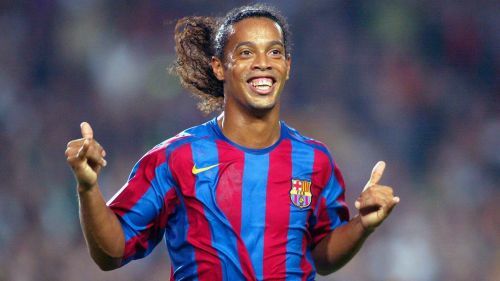 Ronaldinho is known for his dribbling and exquisite ball control. With his charm and calm demeanour, he won the hearts of many supporters, media personnel and fellow footballers. An attacking midfielder by trade, he also played as a forward or a winger. At his prime, there weren't many players who could match his level. He would often decide matches single-handedly. Throughout his glittering career, the smiling Brazilian has won three major individual awards. He has been honoured with 1 Ballon d'Or and has received the FIFA World Player of the year twice. During his five-year spell in Barcelona from 2003 to 2008, he won numerous trophies including two league titles (2004-05 and 2005-06) and the UEFA Champions League in the 2005-06 season. With AC Milan, he landed his only and Milan's latest Serie A title in 2010-11 season. On the international front, he won Copa America with Brazil in 1999. Two more trophies would follow in the form of 2002 FIFA World Cup and 2005 FIFA Confederations Cup.